The Landesgericht Salzburg is the main Court of Justice for Salzburg Province and situated in the city centre of Salzburg. Unfortunately, the Landesgericht is a rather ugly, Historicist building from the late 19th century that does not blend in well with the Medieval and Baroque surroundings at all. 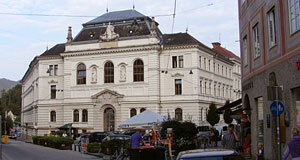 The palatial building occupies a prominent site right to the opposite of the Kajetanerkirche. The court as an institution dates back to 1278, when the right to an independent judicative system was conferred to the Prince Archbishops of Salzburg from the motherland Bavaria. This privilege and sign of independence was maintained throughout the history of Salzburg, even in the early 19th century, when Salzburg was "downgraded" to a duchy within the extensive Habsburg Empire. It was the Habsburgs who formalised the judicative system of Austria in basically the same way as it applies until today: In 1849, Salzburg got a set of county courts and the central Landesgericht; the latter and its equivalents elsewhere in the Empire were chaired by the Oberlandesgericht in Vienna. This chair function was transferred to Innsbruck in 1920 and again to Linz in 1939, where it remains until today. With the economic boom at the end of the 19th century, the population of Salzburg grew and a more modern facility was needed to accommodate the court, which was then located in a building at the Residenzplatz. The current location of the Landesgericht was originally occupied by the Alte Frohnburg, a dungeon/castle like building, and a few smaller houses including a locksmith′s workshop and a toll house for the Karolinenbrücke bridge. The new courthouse was completed in 1909 and has been used by the court ever since then. The roundabout in front of the building (Rudolfsplatz) marks the southern border of the Altstadt; south of the roundabout, you will find only individual houses rather than continuous neighbourhoods that pre-date the 19th century.